See The Who Took Home the Prize! This white paper discusses the Three Keys to building a Smarter Supply Chain: "Connecting the Dots," Creating an Intelligent and Adaptive Supply Chain and Delivering Differentiated, Profitable Customer Experiences. If you have a single distribution center, where in the US do you place it to minimize average transit times (based on US population spread)? We've naturally enough put a lot of focus on global transportation over the years, given its criticality to overall globalization success on both the buy and sell sides. (1) Obviously, most companies have become much better at the practices over the past say five years, yet my sense is many are still behind the curve in process and especially technology versus the importance to the business of being excellent at global logistics. "Both Brasca and IMB's Heil agree it is essential that companies develop a formal "global operating model" - a definition of what processes and functions are performed globally, regionally and locally." 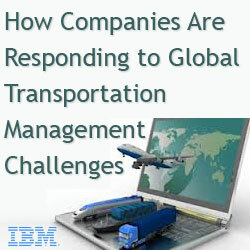 (2) Clearly, many companies are understaffed in the global transportation teams. I recently spoke to a multi-billion dollar life sciences logistics manager, who told me that his group was just himself and one other, and "we're stretched to just get stuff from point A to point B somewhere near in-time. We really have no time for strategic thinking and analysis." I have heard similar sentiments from others. 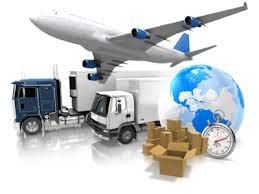 (3) Naturally, the above staffing scenario, lack of deep internal knowledge on the ins and outs of global logistics, the continued move towards outsourcing generally and more have led many companies to outsource most or all of most global transportation processes to 3PLs. Greg Aimi of Gartner noted in his recent new Magic Quadrant on global 3PLs that many shippers want to consolidate their logistics service providers into fewer, more truly global and multi-service partners. But as we'll detail below, one expert says other companies are pulling some processes back from 3PLs and managing internally. With that as a prelude, we've had a few recent events relative to global transportation. First was a major benchmark study and then supporting Videocast on global transportation SCDigest did with IBM, and second a very interesting Videocast just this week with JDA's Fab Brasca, a very knowledgeable and articulate expert on all things transportation. 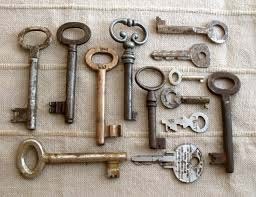 I would like to provide key highlights of each. It's clear that companies are in the process of moving to truly global thinking on transportation management - but most still have a long way to go. 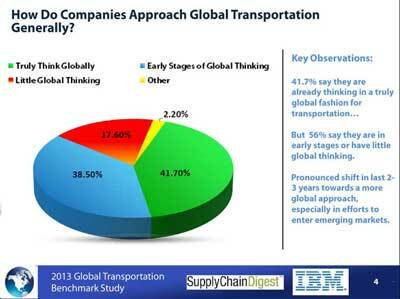 As shown in the chart below, 41% of companies operating globally say they are already thinking in a truly global fashion for transportation - but that leaves 56% who say they are in the early stages of that transformation, or have made little progress. I have written many times about what I call "the 50% problem" - the tendency of companies to consistently overrate their performance in different areas, when by mathematical definition half of every group must be below average. So when I see data that does not show that upward bias, it really gets my attention. 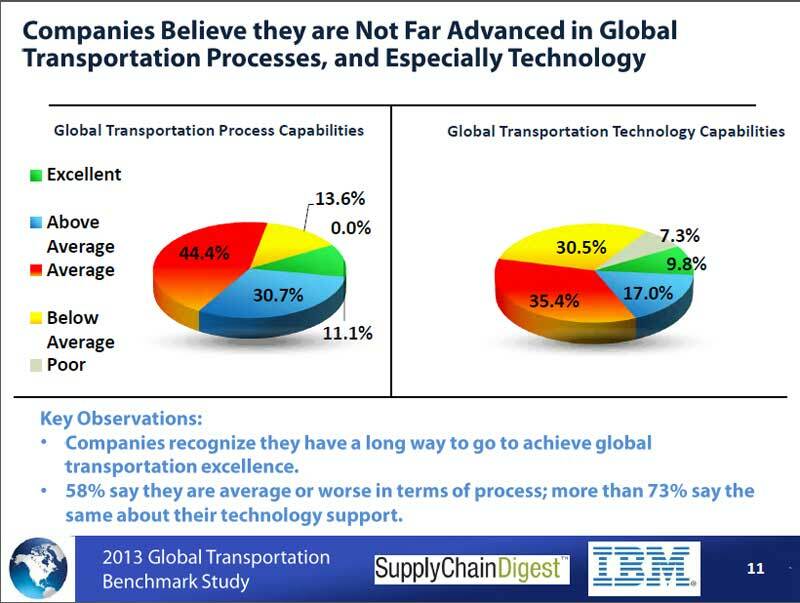 And so it is with another question from the study, which asked shippers how they stood in terms of global transportation process and technology excellence. As you can see above, companies certainly did not overrate themselves in these areas. In terms of processes, just 11% considered themselves excellence, and about 30% above average. The preponderance (44%) considered themselves just average, and almost 14% below average. Where would you place your capabilities? The self-rankings were even worse on the technology side, where only 10% said they were excellent and just 17% above average. I am not surprised at all there - in part because it is only recently that a few TMS providers have really been able to plan and execute multi-leg, multi-mode global moves as a single integrated shipment, a thus few shippers really have such capabilities yet. Full benchmark report is here, on-demand videocast with IBM's knowledgeable Walter Heil here. JDA's Brasca had a number of interesting things to say on global transportation in the fast pace discussion he and I had this week. Among them are that he sees a small but growing number of companies bringing some previously outsourced transportation processes back in house. Part of that, he says, is the increasing visibility that companies can achieve on their own from "control tower" type technologies, and with that visibility can come increased control. A big driver - more agility in global logistics operations when a company pulls some of that control in-house. In the Q&A session, I asked Brasca if this trend of bringing formerly outsourced logistics processes back in-house was more theoretic, based on what can now be achieved, or if it was really happening. "Absolutely" it is happening, Brasca said, noting he sees a change from where it seems companies either largely outsourced global transportation management or they did most in-house to a "hybrid" approach where companies look hard at where in-sourcing can provide real leverage, control and agility and where 3PLs can best deliver value, and often outsourcing the pieces where there is a high level of complexity. Both Brasca and IMB's Heil agree it is essential that companies develop a formal "global operating model" - a definition of what processes and functions are performed globally, regionally and locally, including obviously in-source and outsource decisions. I presented this concept at a conference a year or so ago, and a manager from Ingersoll Rand came up afterwards and said the industrial giant was in the process of doing exactly this exercise. I will note that such decisions obviously depend in part on what technical capabilities a company has at each level, and that of course this model must be reviewed and revised on something like an annual basis. I don't believe a high percentage of companies are really doing that yet. Brasca argued for a concept he called a "global transportation template," which would include such an operating model, but go beyond that to include how transportation teams around the world should be structured, definition of best practices and which of them can be used globally, and more. I liked the idea a lot. The Videocast with Brasca can be found here. This was all very good stuff, and I encourage you to take a look. I will end with just a note that I feel like the industry's "knowledge base" in terms of global transportation management is lacking compared to say domestic transportation management. Someone needs to "write the book." Maybe in my spare time. Any reaction to these insights in global transportation? Where do you think companies stand in terms of process and technology? Do you see companies pulling some work back in-house? Let us know your thoughts at the Feedback button (email) or section (web form) below. Featuring Camille Fratanduono, Assistant Vice President, Pricing, Inventory Planning and Analysis at Pep Boys and Greg Holder, CEO of Compliance Networks. We received a good number of emails from our First Thoughts piece on the Blurring of Supply Chain Planning and Execution. That includes our Feedback of the Week from Ken McKeever of PLS Logistics Services, who actually wonders if we might not be a bit too far over our skis on this one. You'll find that letter, plus others supporting Gilmore's view below. More next week. I am reminded of an old joke that as you progress from a Bachelor's degree to Masters to PhD and beyond that you know more and more about less and less until you know absolutely everything about absolutely nothing. While our ability to detect, analyze and react to the ever increasing speed and granularity of the data is also increasing, the idea of blending planning and execution into one process sounds a bit dangerous. Concerns are now being expressed about people using technology to sort through all the flotsam and jetsam of data to get to that information they are most interested in - Netflix and Goodreads recommend your next movie or book based on previous favorites. News networks tailor their coverage to meet the preferences of a particular audience based on marketing feedback loops thus further concentrating the biases held by the viewer. In the opposite direction, Facebook and YouTube can propagate ideas at the speed of a smart phone whether that idea is freedom for the masses or gangnam-style. We don't yet fully understand the effects on society of these technological changes in the long-run, but we continue to run ever faster. Can a business be too reactive? What are the dangers of being too reactive to the marketplace? Consider the new language being created in the stock market where this technological Eden is most developed - algorithmic trading and machine ecology or more ominously, Flash Crash and Black Swan. How do we avoid the danger of becoming myopic as we are drawn into the ever accelerating current in the center of the data stream? We may experience the thrill of cleverly avoiding the individual rocks in our path as we become more skilled at digesting the ones and zeros before us. But how do we keep in mind that that same current may be heading us for a waterfall before our little stream empties into the larger river. We need a mechanism that forces us to pull off into an eddy now and then for a rest or refit, or to get up onto a hillside to see what is ahead. If "planning" is old-fashioned, we can come up with another word, but we still need oversight and a long-view. I couldn't agree more. I think the only limits on this are how flexible the networks really are/can be. Example: You may be able to change products in a plant on a dime, but if you need different raw material or packaging, who deals with that? In theory should be the supplier, but can they? Will their economics still work? The alternative, of course, is our old standby, just in case inventory for anything that takes awhile. Put another way, your network is only as flexible as your store of the longest lead time item in the process, whether that is raw material, work in process, or finished goods. Could lead to a whole new way of planning, evaluating, and operating networks. This trend is happening where ever companies have to compete on time. Take JIT concepts form the four walls to the Trading Network, lead time reductions in the execution windows that maintain service levels but reduce inventory make for a competitive advantage. I agree with you. Planning and Execution are, have been, and must blur. Some years back, and not that many as you know, these could be different worlds. Hopefully marketing and sales had a direct link to the process (S&OP), but that is not always true even now. As consumers drive us toward a world where they demand near immediate gratification, upstream and downstream partners need to look beyond old paradigms. 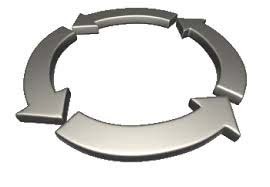 Planning and Execution must become a circular iterative set of events which should also include marketing, sales and distribution. Do we thing of picking, packing, shipping and the related outbound transportation to the customer as totally separate and only loosely related process steps? I hope not!!! Many organizations now plan these tasks end to end during order release to picking. They must in order to ensure that the carrier has assets available, they can pick up when the load(s) are ready so that shipments don't set on the dock taking up valuable space. And internally the shipper wants to maximize the efficiency of its operations such that the orders are packed, packed staged by drop point and made ready for loading just in time for the carrier to pick up. Would we expect less of the demand, planning, sourcing, component receiving, manufacturing (if necessary) and preparation for market? Q: If you have a single distribution center, where in the US do you place it to minimize average transit times (based on US population spread)? A: Vincennes, IN, about 80 miles SW of Indianapolis, according to the annual network study by Chicago Consulting. Study assumes population equals customer demand. © SupplyChainDigest™ 2003-2013. All Rights Reserved.